Zap Light Stun Gun Flashlight Review! 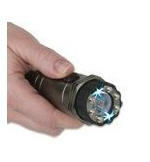 This article is a Zap Light Stun Gun Flashlight review. So if you are looking for information on this product and if it's a quality self defense product for your lifestyle, then you have come to the right place. Lets dig in. 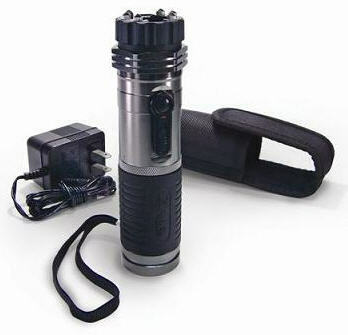 Although it's disguised as a stun gun, the flashlight part of this unique self defense weapon is very bright because it has six LED light bulbs. But, the main feature is that this flashlight has is the capability to stun an attacker with 1,000,000 Volts. The Zap Light Stun Gun Flashlight can also be recharged because it also comes with a charging unit which you can plug into any wall outlet. This wall charger is 120 Volts. The Zaplight Zapper is is a self-defense weapon that can also be used and looks like a regular flashlight. So if you use this flashlight before or during a time where you need to defend yourself, your attacker will be surprised when this flashlight stuns them with 1 million votes. It should be understood that stun guns, including this one, are prohibited in certain states. Check your state laws before ordering one, or read the product description before you order. The Zap Light Stun Gun Flashlight only weighs 8.8 ounces, but the shipping weight is 2 1/2 pounds (comes with a transformer). It has six LED light bulbs which are classified as ultra bright, so the flashlight works very well. Like I said, it has a 1,000,000 V charge and it comes with a wall charger. Customers who have used this product cite how well constructed this unit is, and it is quite sturdy. But it is light and therefore it is easy to tote around. It can easily be stored in a briefcase handbag, or you can easily store it in your car glove box, side storage area etc. You can also carry it while you're jogging because it has a safety leash. If you are in an area in which you are not feeling safe and, for example, if you are a student who walks at night or walks through shady areas, or if you're just walking late at night, or want peace of mind when you're out jogging, walking, or hiking this is something to consider because it'll be handy as a flashlight and even more handy as a self-defense weapon. There are many stunguns on the market but there not many stunguns which also have a second beneficial feature such as a flashlight. You're getting two items in one! One customer noted that the rest safety strap is a bit loose which could be a problem in the event of being attacked because it could be pulled off or simply fall off. Maybe they can change this in the future to be a wrist safety leash or strap that could be tightened. But if you're in the middle of an attack you're going to hold on to it very tightly. I recommend the Zap Light Stun Gun Flashlight. The Zap Light Stun Gun Flashlight is a highly recommended self-defense products because you're getting two products in one. A flashlight and a stun gun that both work exceptionally well. The Zap Light Zapper Flashlight is well constructed, it'll last a long time, and it works. Note: The 1 million volt charge will subdue, hinder, or confuse most attackers. At least temporarily. But there are other stun guns on the market that nave more voltage. For example, you can get a stun gun that has as much as 7.8 million volts or 6 million volts. But this one is a low quality construction and will not last long. It is powerful though! However, what separates the Zap Light Stun Gun Flashlight from most other products is that it is an all around solid, well made, and durable product. The Zaplight Zapper Flashlight Stun Gun is an ultra-bright flashlight with 6 LED bulbs and a 1 - million - volt charged stun gun that will take down any attacker. This unit is rechargeable and comes with a 120v / 60 Hz wall charger. This product is used by anyone desiring to protect family members and loved ones. 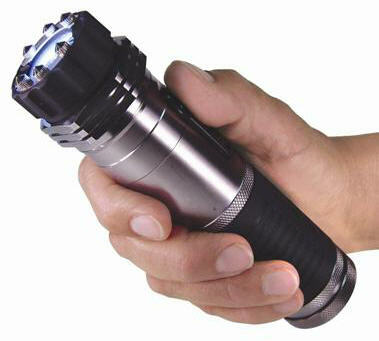 It is a personal security product that looks like a flashlight so attackers wont expect to be zapped. Can be used in all states of the U.S. except states where stun guns are restricted or cities where stun guns have been prohibited. Individuals using the Zap Light Stun Gun Flashlight remark on how strong and well-made the unit is and how light it is it carry. The flashlight will hold a charge for approximately a year so you can carry it in a purse or store it and forget about it until you need it. Perfect protection for college students, someone working late at night or your spouse and children to carry when they are away from home. Carrying the Zaplight Zapper will bring peace of mind to the person because they will have something to use against an attacker that the attacker won't suspect is a personal protection device. The Zap Light Stun Gun Flashlight is ideal to use as a flashlight because it is really bright and is ideal for using on dark nights when walking or when there is a power outage. Products like this that are two-in-one are economical. The only negative aspect of itis that the wrist strap is too loose and should be able to be tightened to prevent it from slipping off the wrist especially if the attacker surprises you. The Zaplight is a good product. It's for anyone wishing to feel safer. It is also a good source of light and has a personal protection device. It can be used by anyone unless it is prohibited by state or city. It works great as a flashlight and comes with a wall charger that gives it enough charge for approximately a year, which is a great value. The flashlight is nice to have around in case there is a power outage and the zapper potential gives great peace of mind.